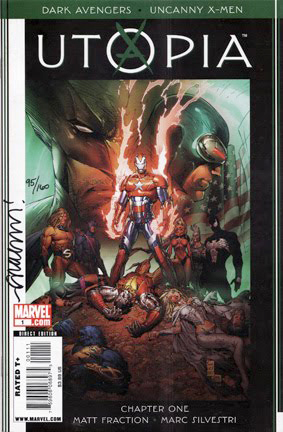 • PLOT SUMMARY: "Chapter 1" The Dark Avengers take on the Uncanny X-Men! Kicking off the 6-part crossover event, rising star Matt Fraction is joined by X-artist supreme Marc Silvestri to bring you a story that shakes the foundations of the Marvel Universe. When mutant riots break out in San Francisco, Norman Osborn declares martial law and sends the Dark Avengers in to quell the riots and take down the X-Men. And that's just the tip of the iceberg. Don't miss the first Avengers/X-Men crossover in over 15 years! This story continues in Uncanny X-Men #513. Cover art by Marc Silvestri.